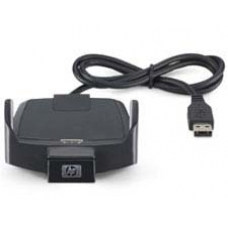 iPAQ cradle, official HP accessory for your iPAQ hx4700 series Pocket PC. Offering a quick-and-easy connection to your personal computer. When used with the AC adapter (sold separately), you can charge your battery every time the iPAQ Pocket PC sits in the cradle. * Spare Part Number 367198-001.